Product #46142 | SKU ANR005925ESD | 0.0 (no ratings yet) Thanks for your rating! 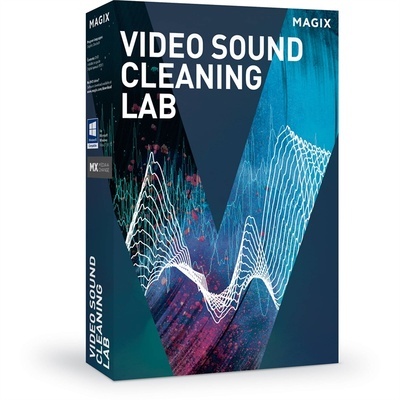 The audio-for-video optimisation software Video Sound Cleaning Lab from MAGIX Entertainment offers a combination of 1-click solutions designed to achieve maximum sound quality with minimum effort, for music and speech recorded in your video footage. It identifies audio issues from camcorders, action cams, digitised VHS recordings or smartphones, and fixes speech that is difficult to understand, distorted due to room acoustics, has annoying background noises, and more. Video Sound Cleaning Lab comes with 150 presets to help you automatically analyse your music and speech recordings, and make suggestions for enhancing them using a suite of effects. Wind, camera noise or electric hum can be reduced or removed quickly and easily. There are also presets dedicated to improving speech intelligibility, reduce sibilants or adjust the volume of your voice. The record function lets you connect a microphone or use a smartphone to add a commentary to your video. The software allows you to export the finished video or just the audio track, in all standard audio and video formats. It also lets you transfer your results as an audio track into any other video editing application.